. @NipseyHussle’s homophobia is more common than one would hope. In his comments are the idea that to be a gay black man means that one cannot be strong — that strength is elusive to gay black men. Nipsey Hussle is facing criticism after posting a homophobic caption on Instagram. "Demonstration speaks louder than Conversation," he wrote under a photo of a group of black youth. "They gone feed us every image of our men and boys but this one. No hyper violent...No homo sexual...No abandoners....JUS STRONG BLAC MEN AND YOUNG Men. RESPECT TO MY BIG HOMIE @bigu1 for Leading with love and intelligence. GOD IS WITH US WHO CAN GO AGAINST US"
DeRay Mckesson called attention to the post on Twitter with a thread that explained that the expressed sentiment is "more common than one would hope." "I’m speaking on this today because I remember being a kid and being surrounded by people who tried to convince us that homophobia was really just love repackaged — that they were just trying to prepare us for the real world, where we’d need to be strong," Mckesson wrote. "Homophobia kills, too." Nipsey responded with a tweet of his own, defending his stance. Meanwhile, others on social media are expressing frustration. 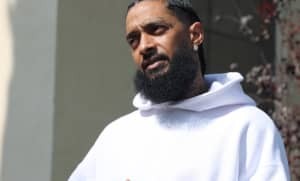 The FADER has reached out to a representative for Nipsey Hussle for comment.